If you are traveling tonight or tomorrow, please take extra time. If you are traveling by plane, please check your flight schedule. 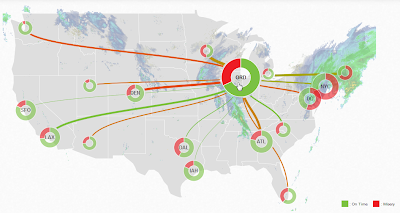 Hundreds of flights have been cancelled, thousands of other flights delayed. A snowstorm pummeling the East has produced lengthy flight delays and treacherous travel on roadways Wednesday. As snow rapidly exits the Northeast into Thanksgiving Day, there will still be some travel trouble spots in the wake of the storm. Aircraft displaced and delayed by the storm in the East may lead to additional flight delays and cancellations on Thanksgiving Day across the nation. Passengers may have to schedule a different flight on an alternate route to get to their destination. In anticipation of delays or cancellations, several airlines, including US Airways, American and Delta, have announced they will waive change fees for passengers scheduled to fly into airports in the line of the storm. Flight Aware shows over 700 flights cancelled into or within the United States. There have been over 7,000 delays. For an interactive map, click on Misery Map then click on a city to see the accompanying misery. 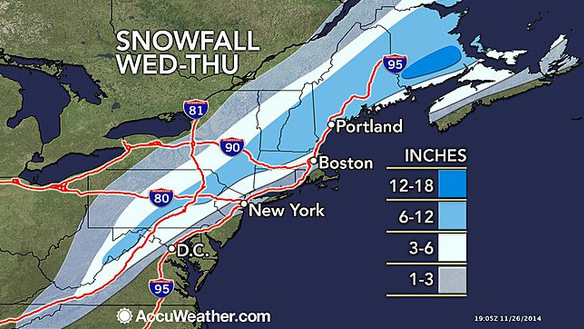 Finally Accweather predicts Patchy Ice, Snow May Slow Early-Morning Surge of Shoppers.